The Trump Administration’s increased immigration enforcement policies have significantly impacted many students and scholars at higher education institutions across the country. Pima Community College, in Tucson, Arizona, provides support for immigrants and refugees who need assistance in transitioning to a college-level education and job training programs that lead to a living wage. Portland Community College, in Portland, Oregon, a state leader in implementing integrated education and training programs, has developed an innovative Adult Basic Skills (ABS) Career Pathways program. Whether it’s enhancing the lives of immigrant families, tackling food insecurity, promoting college success or helping communities in countless other ways, the Kathryn W.
Learn about the Project I-DEA and High School 21+ initiatives at Washington State community colleges and ESL integrated health career pathways at South Texas College – both great examples of how ESL bridge programs are benefiting immigrant students and the colleges alike. 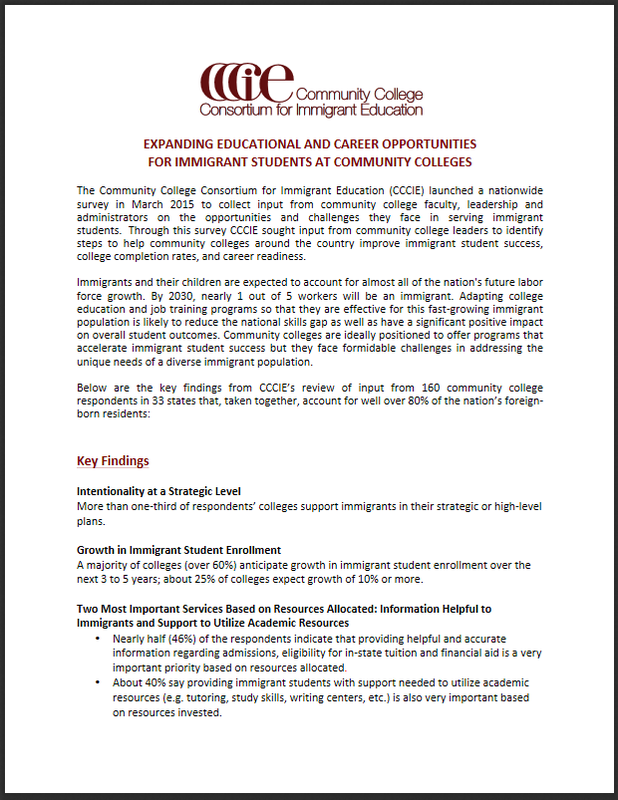 CCCIE launched its National Survey on Increasing Opportunities for New Americans at Community Colleges in March 2015 to collect input from community college faculty, leadership and administrators on the opportunities and challenges faced in serving immigrant students. This guide, developed by CCCIE and World Education Services’ Global Talent Bridge, highlights effective program models and promising practices from community colleges across the country and illustrates how community colleges and community-based organizations can collaborate to increase opportunities for skilled immigrants. 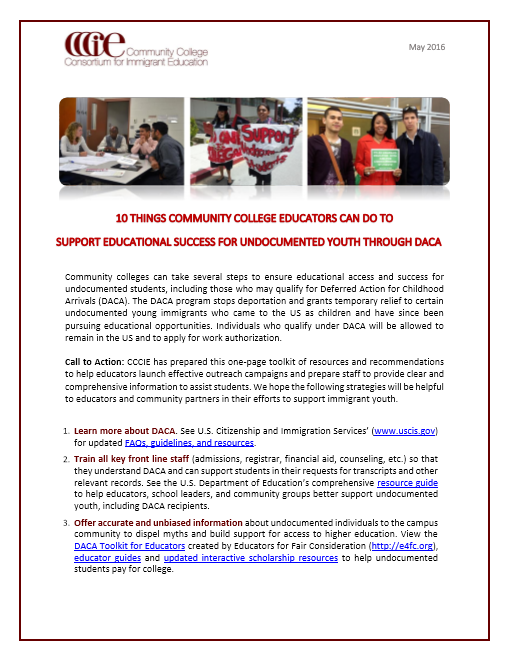 Despite the growth in a vast array of campus resources and services designed to promote the academic, personal, and professional success of all students, immigrant students who could benefit greatly from these services are often unaware they exist. This Issue Brief provides an overview of state-level tuition equity and financial aid policies and describes efforts to pass a tuition equity bill in Florida. 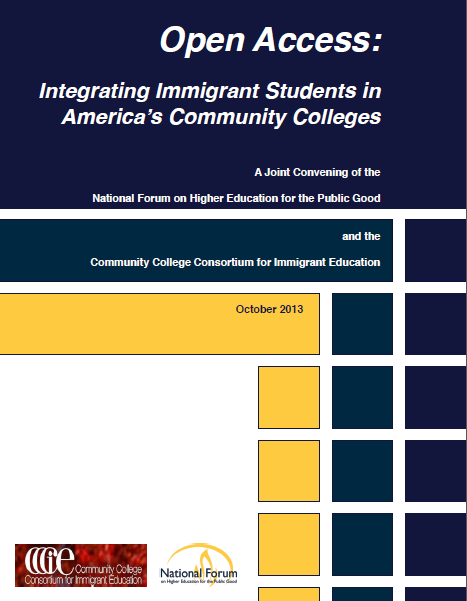 This report, based on a joint convening of the National Forum on Higher Education for the Public Good and CCCIE, explores the challenges and opportunities community colleges face as they serve increasingly diverse student populations, including undocumented students, and also examines policy changes at the state and national levels affecting immigration and postsecondary education.